Hodder has announced that they are about to launch its "biggest fiction launch of 2009" with none other than Dead Men's Dust by Matt Hilton. 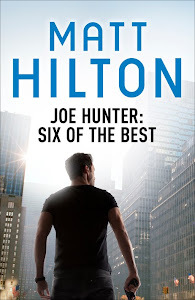 Most of you that have been following this blog know the basic premise, but Hodder editor Sue Fletcher said: "He's (Joe Hunter) a great action hero, he fights all the bad guys and is physically very fit. It (Dead Men's Dust) is a total page turner." Hodder will focus its marketing on national lines, encompassing advertising on the London Underground posters, integrated ads in men's magazines and a major on-line campaign. The official website www.joehuntervigilante.com has already been launched, including a 'shoot 'em up' game and book trailer. I will be a guest on Radio 4 "Open Book" and will appear at festivals including Harrogate Crime Writing festival, Crimefest in Bristol and Thrillerfest in New York. Dead Men's Dust - the first of a five part series - is released in hardback in the UK on 14th May 2009 with the paperback edition published in October 2009 to coincide with the second hardback Judgement and Wrath. Sue Fletcher said my books would appeal to readers of thriller writer Lee Child, who has had 13 novels published in his Jack Reacher series by Bantam. To have my name mentioned in the same line as Lee's is a great honour. With all that support, Matt, they must have massive faith in you. Me thinks you're onto a winner, mate. Thanks Col. If everything goes to plan, things might just turn out great. I can't wait, but i guess you know that already.